Measurements: 5.7 in (145 mm) long, 3.7 in (95 mm) between holes on center. Fits a metal spline approx 3/4 in tall. See the full details for more information on determining the proper size handle, or download and print our sizing sheet on an 8 1/2 x 11 (letter size) sheet of paper. Fits: Vintage era 8 in pans, 10 in & 12 in skillets, 10 in square skillets, large griddles, and possibly others (definition of skillet, pan, etc. here). These fit Revere Ware pans with handles that have two screws through the Bakelite. Please see the detailed information about this part to see any special considerations for this part and ways in which they differ from original Revere Ware parts. These are x-large sized replacement handles for vintage era Revere Ware pans. 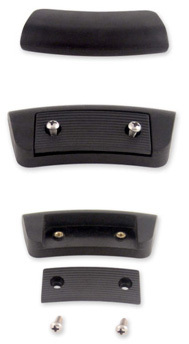 Please use the information below and the pictures to make sure they will fit your pan before you buy.These parts are newly manufactured by reverewareparts.com and are made to look and work just like original Revere Ware handles. Measurements: 5.7 in (145 mm) long, 3.7 in (95 mm) between holes on center. Fits a metal spline approx 3/4 in tall. The screw and barrel nut in the hardware set included with this handle are a different thread pattern than original Revere Ware hardware and are not interchangeable with original hardware parts. How to determine the proper size handle: We sell small, medium, large, and x-large size of this style 2-screw handle. It is fairly straight-forward to determine the proper size handle based on the height of the metal spline (the metal part the two handle halves go around) , the distance between the centers of the two holes, and the overall length of the Bakelite part of the handle. If you check your measurements and cant’ find a match, please contact us to ask for help before purchasing. 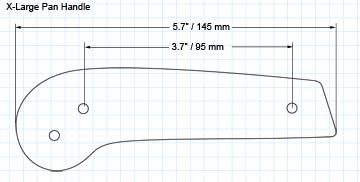 You can also download and print our sizing sheet on an 8 1/2 x 11 (letter size) sheet of paper to hold up to your old handle to determine the proper size. Replaces: Revere called this handle style “Style No. 2” and “2-screws”. The original Revere part number for this handle (x-large size) was 36018. It also had an older part number of the 6xx type that we have not been able to determine. The screws in the hardware set are Phillips head, not slotted like the original Revere Ware screw sets were. Because the original slot head screws strip very easily, we consider this an improvement. Bakelite is a great heat resistant material, but it can be a bit brittle. The most important thing is to not over tighten the screws when assembling the pan handle or you can crack the handle. 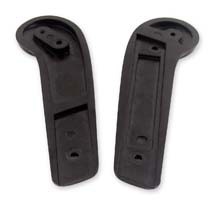 It is generally not a good idea to put Bakelite parts in the oven; it can make them dull or in some cases crack. We do not offer our Bakelite parts as oven-safe. 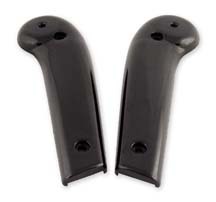 It is generally not a good idea to put Bakelite parts in the dishwasher; the soap will eventually dull and dry out the surface of the Bakelite. We do not offer our Bakelite parts as dishwasher-safe. When removing your hanging loop from the old pan handle, first remove the handle from the pan. Then, if you open the loop up just a little bit with a pair of pliers, you can slide one half of the handle out, and then the other half. Before you put the new handles on, put the hanging loop in one half of the handle, then slide the other half in and squeeze the loop closed a little. You will find it much easier to put the loop on before attaching the handle to the pan than after. We have seen about 5% of handles where the screw holes are off just enough to make it very hard to get the nuts to go all the way through. The is just a natural variation in the original Revere manufacturing process. Widening the hole slightly with a drill or file has fixed every one of these for us. In some cases, the old screws can rust together and are very hard to get off. Twisting the screw also twists the nut on the other side. You can try pressing a slotted screwdriver between the edge of the nut and the Bakelite to create some resistance to keep the nut from turning, but if it is truly corroded, the only real solution we’ve found is to break the Bakelite off by prying between the two halves with a screwdriver. Once the Bakelite is off, you can grab the nut with pliers. Fits: Vintage era medium, large, and x-large skillet and pan handles (definition of skillet, pan, etc. here). These fit Revere Ware pans with handles that have two screws through the Bakelite. If you are looking for a new hardware set for your 2-screw Revere Ware handle, this is mostly likely the one you need; this set fits 99% of all the 2-screw handles. This hardware set is specifically made for the medium, large, and x-large sized handles. We also sell a small hardware set which only fits the small handle; the small handle fits very very few cookware pieces. Measurements: 5.25 in (130 mm) long, 3.1 in (79 mm) between holes on center. Fits a metal spline approx 3/4 in tall. See the full details for more information on determining the proper size handle, or download and print our sizing sheet on an 8 1/2 x 11 (letter size) sheet of paper. Fits: Vintage era 7 in pans, 8 in skillets, 9 in square skillets, and possibly others (definition of skillet, pan, etc. here). These fit Revere Ware pans with handles that have two screws through the Bakelite. 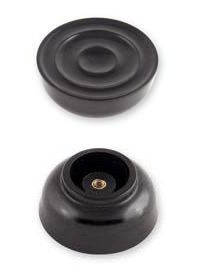 Includes: Bakelite knob with brass screw insert. A separate screw is NOT included as all Revere lids have a screw attached to them. Fits: All Revere Ware lids, vintage era and newer that have a similar looking knob. This knob may not fit Revere Ware lid styles that have a different looking knob. Measurements: 4.6 in (117 mm) long, 2.6 in (66mm) between holes on center. Fits a metal spline approximately 5/8 in tall. See the full details for more information on determining the proper size handle, or download and print our sizing sheet on an 8 1/2 x 11 (letter size) sheet of paper. Fits: Vintage era 5 ½ in and 6 in pans, 7 in skillets, and possibly others (definition of skillet, pan, etc. here). These fit Revere Ware pans with handles that have two screws through the Bakelite. Fits: Vintage era pots and Dutch ovens. If your pot handles look like these, they should fit. Measurements: 8 in (200mm) in diameter, 0.59 in (16mm) thick. Fits: Vintage era 8 inch 4 quart pressure cookers. See pictures below to make sure yours looks like them. This gasket will only fit the older 4 quart pressure cooker. This gasket will not fit newer 4 quart and 6 quart pressure cookers characterized by the heavy metal pressure regulator made to look like a Revere Ware nob. Fits: Vintage era small pan handles (definition of skillet, pan, etc. here). These fit Revere Ware pans with handles that have two screws through the Bakelite. These will only work with the small two-screw vintage style handle. These screws and nuts will not fit in the larger handle sizes or the single screw newer handle. Only 1% or less of the Revere Ware cookware requires the small handle. If you think you have a small handle, please check it against the measurements of our small handle before ordering this hardware set. Please see the detailed information about this part (the “See details” link under the images) to see any special considerations for this part and ways in which they differ from original Revere Ware parts. Measurements: 9 in (229 mm) in diameter, 0.44 in (11 mm) thick. Fits: 1970’s era model 1574 4 quart pressure cookers. See pictures to make sure yours looks like this model. This gasket will only fit the 1574 model 4 quart pressure cooker. 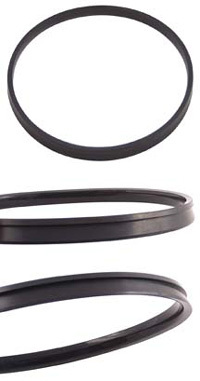 This gasket will not fit vintage 4 quart or newer 1576 and other 6 quart pressure cookers.